Place the head of your toothbrush against your teeth, then tilt the bristle tips to a 45-degree angle against your gumline. Move the brush in small circular movements, several times, on all the surfaces of every tooth. Brush the outer surface of each tooth, upper and lower, keeping the bristles angled against your gumline. Do this again, but on the inside surfaces of all your teeth. To clean the inside surfaces of your front teeth, tilt the brush vertically and make several small, circular strokes with the front part of the brush. Brush the biting surfaces of your teeth. Brush your tongue to help freshen your breath and clean your mouth by removing bacteria. As some of you might be aware, Bridge Dental Clinic helps and sponsors The David Sheldrick Wildlife Trust, which is based in Nairobi, Kenya. 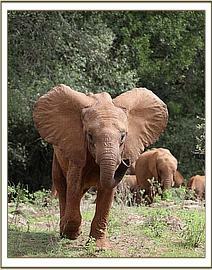 The aim of the trust is to help preserve Africa’s endangered elephant and rhino population. They have recently posted an update about the rescue of a baby elephant they named Sagala (after the mountain which is visible from where she was found). She was found abandoned, dehydrated and with a pride of lions very close by. but if you have time then it’s worthwhile to read about it in their latest update. Here she is happy and healthy in the Nairobi National Park. Thank you all for supporting us allowing us to be able to support a cause that’s very dear to our hearts. Did you know that we offer free examinations for children up to the age of 16? With a recent BBC News article showing that nearly 40,000 children a year in England are having to have teeth extracted, we feel it’s more important than ever to help you protect your children’s teeth. When you visit Bridge Dental Clinic with your child we can also give advice on how best to look after their dental health at home. For a little extra help, and before you come to see us, here’s a video produced for the Childsmile scheme from NHS Health Scotland which tells you how to brush your child’s teeth. Remember, children’s toothbrushes should be replaced every 3 months, or when the bristles start to become splayed. We’ve got a selection available at the reception and would be happy to help you choose the best one for your child. Should you use Charcoal Toothpaste for Teeth Whitening? We’ve had a few people ask us about charcoal toothpaste, so we thought we’d update you with the latest medical research and share a more visual experiment by a couple of young dentists. Firstly, dentists Jay and Luke did a bit of an anecdotal experiment and filmed it for their YouTube channel, Tooth be Told. They used charcoal toothpaste for one week, measured whiteness before and after, and found that it made no difference. They also noted that it tasted particularly unpleasant. Although this isn’t a scientific experiment, it’s good to see and hear results from real people who happen to be experts in this field. To find move conclusive results, we turn to The Journal of the American Dental Association. Their research indicates that further studies need to be carried out, but through looking at 118 eligible articles conclude there’s insufficient evidence to be able to recommend charcoal toothpaste as a way of whitening your teeth. In summary, if you are going to try charcoal toothpaste, please make sure it contains fluoride otherwise you will need to brush again with another toothpaste. If you really want to get whiter teeth then please book in for a consultation with Bridge Dental Clinic where we will assess you for a custom tooth whitening kit. 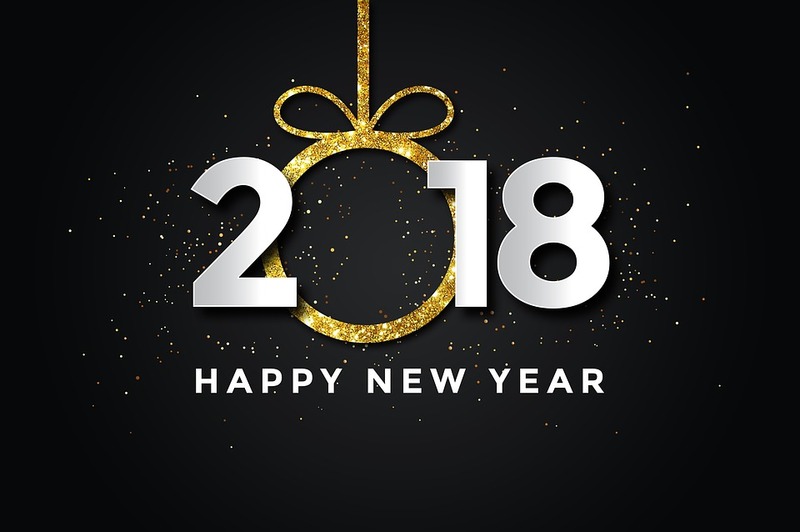 We’re back after the Christmas break and would like to wish all of our customers and friends a HAPPY NEW YEAR. 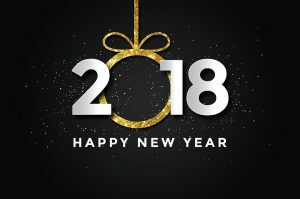 We hope 2018 is healthy and prosperous for all of you. To help start 2018 off in a healthy manner, and since many of us will have consumed a few more sweet treats than usual over the holidays, why not get yourself booked in for a checkup? For those of you who are very busy or don’t get a chance to call during the day, you can book your appointment ONLINE HERE where you can see all of the slots we have available. Our opening hours are 8.30am – 5.00pm Monday to Friday. We hope to see lots of you soon and we look forward to sharing news, tips and ideas to keep your teeth and gums healthy for life! As Christmas 2017 fast approaches, we just wanted to update you on our opening hours over the holiday period and thank all of our customers for their support throughout the year. We’ll be closed from Friday 22nd December at 12.30pm and will reopen again on Tuesday 2nd January at 8.30am. For those with an emergency over over the holiday period, please call 07911 721759 for the emergency dentist. Over the holiday period there is a £230 call out charge as well as treatment costs. 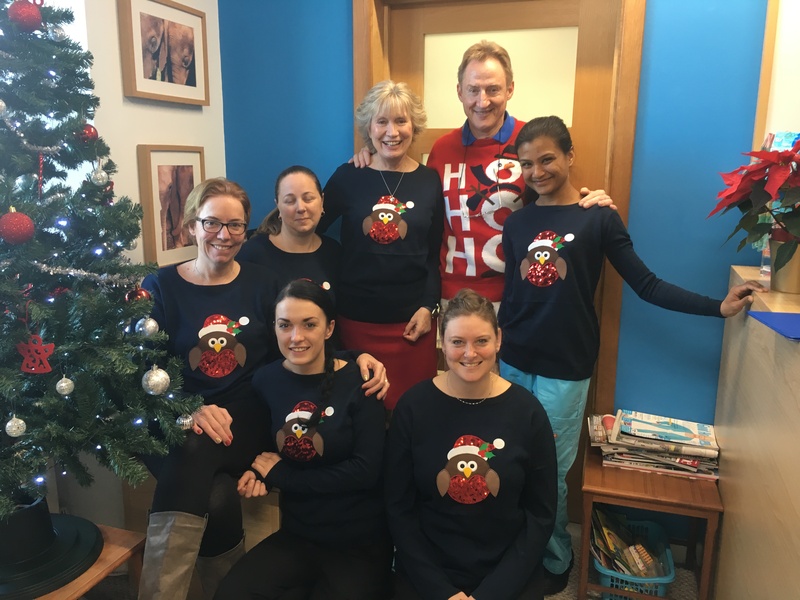 2017 has been another busy year for the team at Bridge Dental. 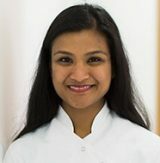 In April we welcomed Dr Ushita Shah (Ushi), to the practice and I’m sure you will all agree that she has been a great addition and has seen many of you on her first eight months here. 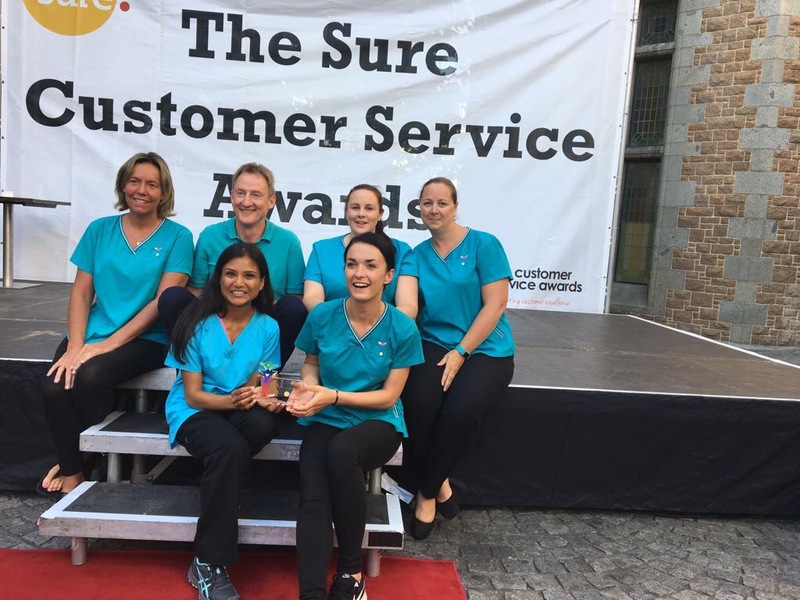 In July, Bridge Dental Clinic was also honoured to have won the Customer Services Awards for the best business in Guernsey. This was a great boost to all of us who try our best every day to help customers and each other. Finally, at the start of December we took part in Save the Children’s ‘Christmas Jumper Day’ where, as well as a bit of fun, we helped contribute to the £652,630 that has been raised this festive season. All the money raised will go to helping improve the lives of Children around the world. WOW, we were very happy last week to win the Customer Services Awards for the best business. The Customer Service Awards have been running in Guernsey for around 9 years. During this time I have seen many people be nominated and many people win, also others who were disappointed to lose. I have been to the awards ceremony a few times and been delighted to watch the anticipation as those shortlisted have been read out and then the surprise on the faces of those that won it. Never thinking that as a team at the Bridge Dental Clinic we could win, we decided to participate and encourage some of our wonderful patients to nominate us. All we asked is if you feel that you get good service from this business, would you be happy to nominate us. People often say, ‘if you are not in the race, you can’t win it’ so we decided to be in the race. Good customer service is the lifeblood of any business, everything flows from it, from our reception staff, to the dental teams. 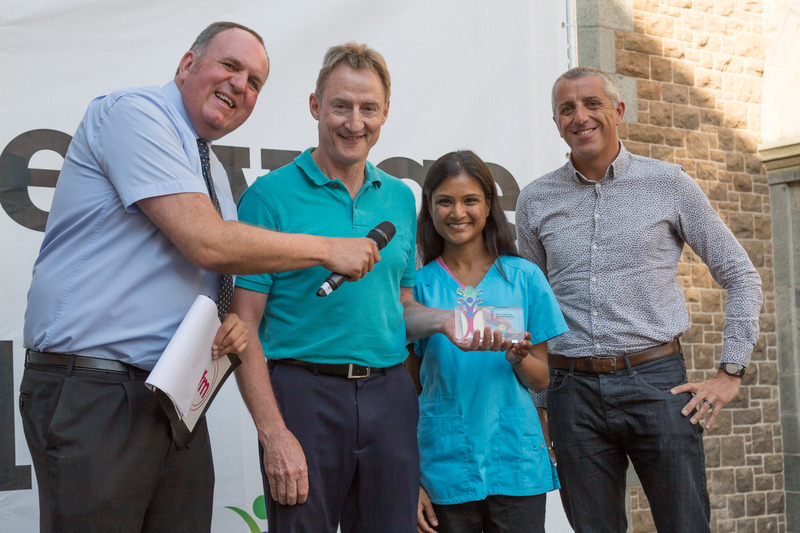 Not only are delighted to have won the ward it also shows that our we work well as a team and everyone here at Bridge Dental has a positive attitude towards all the patients who walk through our door. Our beautiful trophy now has pride of place on our reception desk and we as a team are delighted. Thank you to all our wonderful patients who felt that over the past year we had given them good service. Many of our patients are nervous and phobic and all they want to do is get out the door as quickly as possible. We are not a place that many people want to visit and we really appreciate when a patient takes the time to thank you or well done. Teamwork is the edge that made us winners. Thank you also to The Busy Bee Hives whose role is all round customer service and who also sponsored the award. 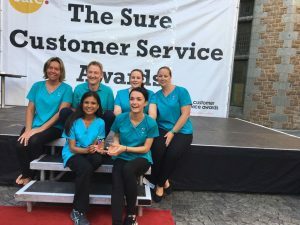 They have written a really good article about the Customer Service Awards and its certainly worth a read. 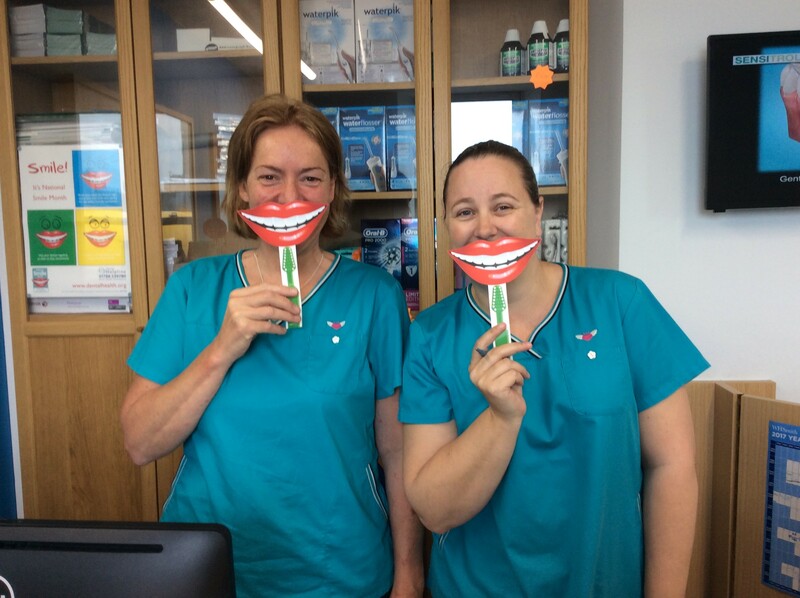 SMILE -In a nutshell, National Smile Month is the UK’s largest and longest-running campaign to promote good oral health and is run by the Oral Health Foundation. Here at the Bride Dental Clinic on this last day of Nation Smile Month we have, smiled our way through the last 4 weeks. We took lots of photographs of our team smiling and posted them on Facebook. We ran a promotion on teeth whitening to help anyone who wanted to their smile brighter. Our like and share competition, saw one lucky winner receive £100 of dental treatment. Finally our most fun and proactive event, was a visit to Vale school. 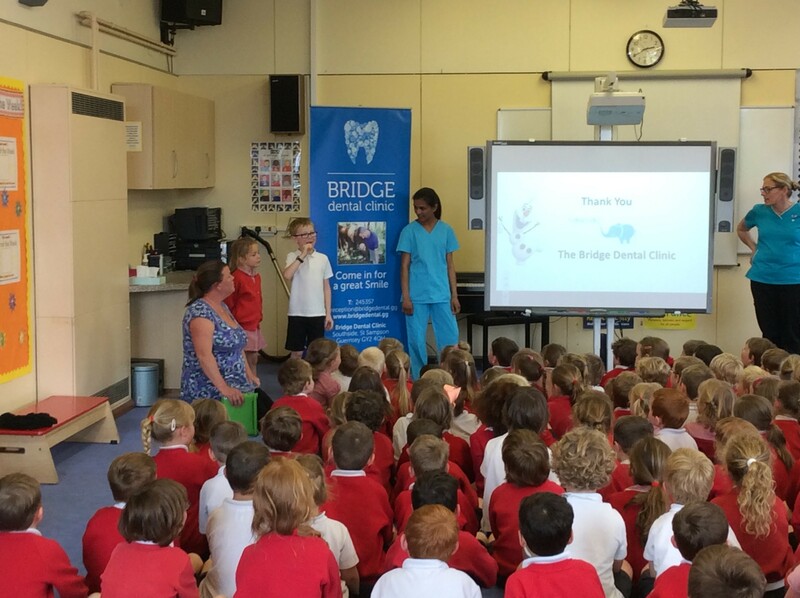 Dr Ushita Shah held an assembly for the infants to talk about their key dental hygiene. It was a lovely opportunity to help the children learn a bit more about dental hygiene and the importance of cleaning their teeth. Dr Shah enjoyed her time with the children and said “it was good to spend time with the children and interact with them away from the dental surgery”. At the end of the assembly all the children received a pack containing a toothbrush, timer and teeth cleaning chart, which we are sure will help the children understand how long and how often they should clean. It is certainly something we would like to do again, during National Smile month next year. We hope that next year, we can have more fun smiling and thank you to all those that helped us promote it. She enjoys traveling and exploring the culture and lifestyle of different places. She has travelled around India and South America, where she hiked the Inca Trail in Peru. She was a member of the Isle of Man Taekwondo Team. She also enjoys voluntary work and is currently raising funds and overseeing a challenging orphanage project in Kenya. Toothbrushes, do your old ones go straight in the bin or do you find another use for them? What brought this to mind was cupboard cleaning.. There was a few at the back of our stationary cupboard and I asked the receptionist why? She replied. “They are too hard and not recommended for teeth cleaning but they are brilliant at cleaning in corners and keyboards” This got me thinking about uses for my old toothbrush, then I found this article on-line. The Oral Health Foundation – Old Toothbrushes. “How many toothbrushes do you think you have thrown away during your life? We are advised to change our toothbrush every three months. So, in theory by the time somebody is 30 they will have already binned around 120 bristled friends. 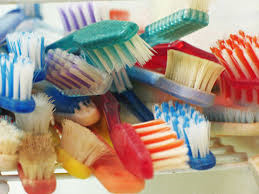 There are estimated to be more than 64 million people in the UK which could mean more than 256 million toothbrushes are discarded every year. That’s a very big pile of plastic but have you ever thought what happens to them? Here at the Oral Health Foundation we have taken a look at the potential uses for your toothbrush after it has finished its primary job of cleaning your teeth. What we have found is that we are remarkably creative when it comes to prolonging the usefulness of our little bristled friends. Encouragingly, our research shows that 80% of us choose to repurpose our toothbrushes, so here are 10 best life hacks which could save you valuable time and money and your environment. 1. Nail brush magic – Admit it, removing that stubborn dirt from beneath our nails can be difficult and even tedious. Use your old toothbrush to remove it in seconds! One person even told us they keep one in their handbag just in case they need to brush up on the go.